I think it's fair to say that two of the lasting effects of the old school renaissance are the popularization of the term "sandbox" to refer to an open-ended campaign setting and the holding up of Judges Guild's The Wilderlands of High Fantasy as the premier example of a sandbox setting. The term "sandbox" is one I'd never heard, let alone used, in a tabletop RPG context until a few years ago, being, ironically, borrowed from the world of video games. And, while I knew of The Wilderlands of High Fantasy and even used it (briefly) back in the day, I never held it up as a model I wanted other campaign settings to emulate. How things change! All within are merely inspiration for the active and pontifical judges of the guild. Please alter, illuminate, expand, modify, extrapolate, interpolate, shrink, and further manipulate all contained to suit the tenor of your campaign. I really like that quote and it nicely highlights one of the continually fascinating things about the Wilderlands setting: it's very flexible, even protean. Every time I have ever encountered or heard of a referee using it for their home campaign, I've been struck by just how different his home campaign is, not only from the "official" Wilderlands as published by Judges Guild but also from every other Wilderlands campaign run by other referees. A big part of why this is the case is that The Wilderlands of High Fantasy, despite focusing on five of the sixteen regions of the overall Wilderlands setting, nevertheless devotes a lot of its 32 pages to collections of random tables and new rules. Thus, there are tables for ruins, caves, and lairs, in addition to rules for hirelings, prospecting, and income, among other topics. These tables and rules are clearly designed to facilitate campaigns where the characters wander about the world, exploring it hex by 1056-foot hex, in search of fame and fortune according to their own lights rather than any overarching plan concocted by the referee beforehand. Another big part of why Wilderlands campaigns differ so much from one another is the sketchy nature of the setting information The Wilderlands of High Fantasy presents. A typical settlement is given a name, a population, a racial "type," general alignment, the name and characteristics of its ruler, and its primary resource. Hexes containing features of interest get a single line of description, such as "The crystallized skeleton of a dragon turtle is buried on the sandy beach. The skull houses a giant leech." There are no game stats or explanation here, just a very basic idea for the referee to read and, it is hoped, to be inspired by. As a younger person, the Wilderlands didn't thrill me much and the presentation of the setting in products like The Wilderlands of High Fantasy was the main reason why. From my youthful perspective, I felt that authors Bob Bledsaw and Bill Owen hadn't done "enough work" for me. Sure there were maps, including player's maps that didn't have complete information about settlements and geographic features, but what I really wanted was a lengthy historical overview of the setting and more detailed information about its peoples and locales. The Wilderlands of High Fantasy gave me none of that, instead expecting that I'd fill in those blanks myself, using the vague details, random tables, and new rules as raw materials from which to craft my own setting. After all, that's what being a referee is all about, isn't it? And suddenly I see the inspiration for two Barbarians from a certain Dragonlance Saga. Who could they be? Yes, I agree. 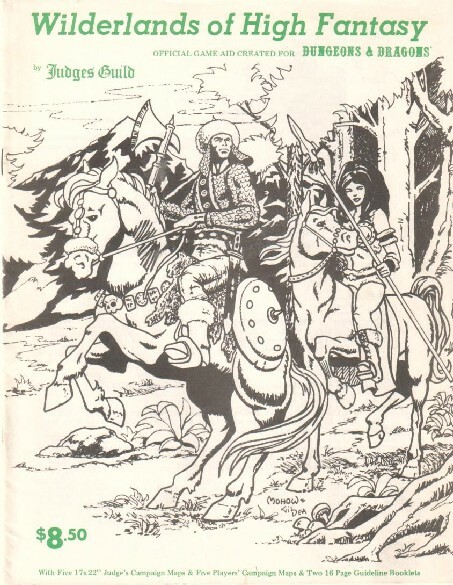 It's strange but for years I'd heard loads about the official maps and the different settlements but really - Judges Guild D&D is laser-focued on BM utility - and it's about the tables and the setting emerging during play. The City State is an example, a benchmark, though people have tried to make it canon, like another Glorantha. As I'm making a whole rpg off the Ready Ref sheets at the minute, the point is hammered home - DIY - the vibe that Gygax later thoroughly rejected with the embellishments of Yggsburgh. The sandbox term, in the context of applying it to a campaign type, originated among the Wilderlands team to describe what do with the Necromancer Boxed Set. No clue as to who came up with it, although I immediately started using it when I read it. I think you will find a similar diversity among early users of Traveller's Spinward Marches. Although the later release of Third Imperium material masked those early marches campaign. Ironically I started out with your POV on campaign detail having fallen in love with the Return of the King appendixes and their broad reaccounting of Middle Earth's history. I started immediately to use Greyhawk when it came up but grew increasingly dissatisfied with the setting. The material was good, and inspired a lot of good adventures for the characters. But it faltered for me on the howling emptiness of the 30 mile hex. This particularly became onerous during the last phase of my last Greyhawk campaign where the players were recruiting armies and running realms. The Wilderlands had the detail and didn't have a lot of high level background. So it was quite easy to switch the campaign from Greyhawk to the Wilderlands and still keep the focus on the politics and adventure of running a kingdom. I use Map 3 Valley of the Ancients created a kingdom using the existing locales, and ran with it. I could use the stats to tell what resources everyone had. Plus City-State was a complete city that had the right level of detail to allow custom plots but not force the referee to create everything outside of a handful of buildings. So the Wilderlands became my goto campaign setting and eventually evolved into the Majestic Wilderlands. * relatively low power level (which makes player characters quite potent by default) - and even the Invincible Overlord is not really invincible, just a mortal (although admittedly high-level) douchebag. The cool thing about it, I can pick a random locale on a random map, look at the surroundings of the starting point, and the ideas/adventure hooks keep on coming and coming. It is a great fit for my playing/GMing style." Addendum: I can see where someone with expectations for a more detailed setting may find the product lacking, although I am pretty sure that if I had encountered it when I was 13, I would have loved it to bits. If there is one thing I do not like about it, it is that the various regions are not differentiated enough - you have Barbarian Altanis, Valon, the Southern Reaches and the Silver Skein Isles, and in every single one, you get villages named Greenborough, Wolfstone, Darkbridge and the like. Granted, that's very easy to remedy. I've been struck by just how different his home campaign is, not only from the "official" Wilderlands as published by Judges Guild but also from every other Wilderlands campaign run by other referees. Too right. I'm currently working on a Wilderlands sandbox campaign that will use Rob Conley's Majestic Wilderlands and Scott Driver's Wilderlands of Darkling Sorcery as jumping-off points as I customize the hell out of my map and setting. I actually sold off my Necromancer-era Wilderlands box set and CSIO hardback this year because I realized I simply didn't need or want that level of detail. It's much more fun to start with a map and some vague descriptions as a catalyst to creativity and go from there. I really love the original Wilderlands, warts and all, especially because of the random tables and all those maps. Plus some just weird little encounters in the listings of individual hexes. It definitely is customizable. I've run campaigns with it ranging from the titular High Fantasy to dark & gritty Sword & Sorcery, to Dying Earth-style sci-fantasy post-apoc. I'm surprised at the lack of hex-map options for more contemporary d20 campaign settings like Golarion or the Known Realms. I had these sets when I was a kid in the '70s and I totally loved them. I am going back over them again now, and I have to say that I enjoy the little island and ruins ideas the most. It's just great stuff. I loved Judges Guild stuff mostly for the feel of it. It got me doing "weird fantasy" in my setting long before James Raggi coined the term for his D&D. More than mainline TSR stuff, it was a sense of wild, mix and match elements from all over literary fantasy, and most of all the idea that anything can happen. Like the aformentioned detail of a giant leech in a dragon skull on the beach, to things like stumbling across a city in the middle of a howling wilderness. No matter how wacky JG items were, they always sucked you in to it's multiversal vibe. As teens, my players and I had a great time island-hopping among the Isles of the Blest (Wilderlands of the Maghic Realm) and finding the adventures in Paul Jaquays' Book of Treasure Maps. Despite this, I didn't really see the true possibilities hidden inside the Wilderlands until much later, when I started to learn more of the background and history of the Wilderlands and the different cultures within. I'm running a 4e Wilderlands game in Barbarian Altanis right now. Great setting, though as Melan notes the villages & cultures could do with more differentiation. I kinda solved it by saying the villages were Nerathi (4e fallen pseudo-European-medieval empire), the Nerathi were Alryan (from the City State) & thus culturally distinct from the indigenous nomadic barbarian Altanians. Yeah, I also thought JG sucked when I was a kid. The cheap paper, printing, and art certainly didn’t help. By '81, other companies' products had a much more professional presentation. Also, back then, when I bought a module I expected it to be ready to go. Modules were for when you didn’t have time to get your own stuff done. If you were going to blow your hard earned cash on them, they had better be complete! JG stuff just seemed so bare bones and lame. In the past couple of years, I’ve done a complete 180. The other modules seem stale and stagnant while the JG stuff is completely inspirational. Just this past month, I printed off all of my JG pdfs for Wilderalands and City State and placed them in binders. It was a huge pain, and a massive ink drain, but it’s much easier and cheaper than trying to acquire any of the actual books. Ironic, as most of their books were in the bargain bins for decades. I was at FANexpo last weekend and the only thing I bought was a Mint copy of Castle Books II (by JG) and a the JG GenCon X Tournament Dungeon "Skulls & Scrapfaggot Green". ... It was like finding a goldmine to me! I have and still love the Wilderlands, ever since I found it and on a whim bought it at 'Fandom' my FLGS in late 70's early 80's. The City State is an example, a benchmark, though people have tried to make it canon, like another Glorantha. Yes, I've noticed this and it's crazy. Of all the settings I can think of, the Wilderlands is the one least suitable to being treated as a repository of inviolable canon. I still have fond memories of my version of the Wilderlands. Although I never really used the accompanying guides. I did use the Island and Village books though, although mostly they were unmmapped (villages being connected to towns and cities and islands were things you randomly encountered). You could easily blend them to your needs. I definitely upped the population density though. With the city of Necropolis in the Valley of the Ancients to which funerary processions from around the known world would transport loved ones to specially prepared tombs. Which were a prize for tomb raiders. Most of the "dungeons" were these tombs. And with massive dirigibles transiting between the major cities, not to mention the first major commercial railroads (thanks to a Technologist character class), I suspect that campaign was a lot different from most. Although the prize of my collection is a massive set of random encounter tables published in one of the early newsprint Judges Guild Journals. Which has remained my primary random encounter tables for a very long time (and multiple campaigns). I think this was the first D&D related product I bought with my own money! And as I recall, it took all the money I had at the time. :-) I loved the map and later I bought the City State. What I didn't like, after I started looking at it more, was the absolute random nature of most of the tables. Like the Flora table, where one roll could give you an oak tree and the next a palm tree. When you looked too closely you saw it was mostly garbage with a few gems thrown in. It is the most important publication for the OAD&D game in my view. Rob Conley says: "I think you will find a similar diversity among early users of Traveller's Spinward Marches." Absolutely right. The Spinward Marches are a complete sandbox; the Third Imperium is implied but not explained. I never really looked that closely at the JG stuff, having the sense that it was shoddily made and that DIY was The Way To Do Things when I was younger. I completely missed the notion of adding my own spin or even taking inspiration from that material. Interestingly enough, I wonder if Original Empire of the Petal Throne's really large hexes - 82.3 miles from side to side - might have contributed to their lack of development. It is certainly the case that The Northwest Frontier maps are clearly the analog to Wilderlands but saw nowhere near the same sort of use. Hmmm. Like the Flora table, where one roll could give you an oak tree and the next a palm tree. Never played in the WL -- and as arcadayn mentioned above, in my younger days JG stuff always seemed like "TSR-lite" products I didn't want to waste my small allowance on. But the key thing I missed was they were trying to *spur* my imagination, not lead me along the pretty choo-choo tracks they'd built. All these years later, as I get back into RPGs, I have a much greater appreciation for my own abilities to run with a minimum of material. Give me some kindling and I'll build you a Bonfire of the Gods! Same here in California. Happens all the time.